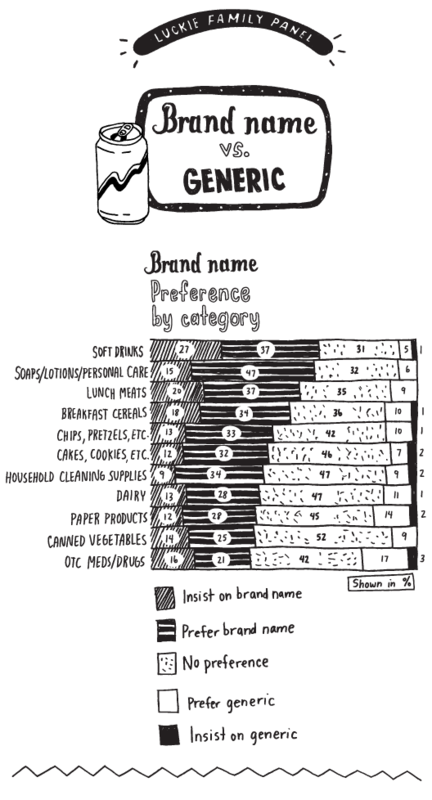 Brand Names Vs. Generic Products – Which Do Americans Prefer? In our latest Luckie Family Panel, we asked parents across America about purchasing brand name products versus generic products. I insist on the brand name. I prefer the brand name. I have no preference between brand and generic. I prefer the generic product. I insist on generic product. Overall, the strongest consumer preference (insist + preference) for branded products among the 11 categories we tested were soft drinks (64%), soaps/lotions/personal care products (62%) and lunch meats (57%). The lowest three brand preference categories were paper products (40%), canned vegetables (39%) and OTC medicines/drugs (37%). Otherwise, there was very weak preference for generic products, with most of the remaining consumers for each category saying that they had no preference between brand name and generic products. The two strongest categories for generic products were paper products (16%) and OTC medicines/drugs (20%). The No. 1 driver for brand name products was “quality products” – 57% of respondents said that it was a very important attribute, and 55% of consumers saying that “quality products” describes brand name products. Two other strong drivers for brand names were “trustworthy company” and “safe products” with a significant number of consumers saying those attributes describe brand name products. Investment in R&D was also strongly associated with brand name products – but consumers don’t rank that as being very important. Also note that consumers rank “lowest prices” as very important – but behind quality, safety, value and trustworthiness. 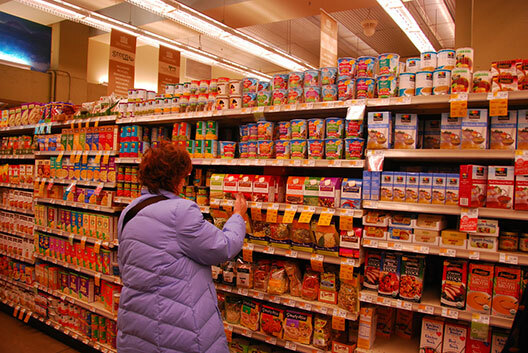 Only 13% of consumers associated the lowest prices with brand name products. Brands continue to matter. Even in the lowest category, more than a third of consumers insist on or prefer the brand name product. Brands overall have done a good job in driving home the message of quality. There is still considerable room for brands to build brand preference in most categories – between a third and half of consumers say they are indifferent when it comes to choosing brands and generic products. For all the smirks about the “cola wars,” the truth is that Coke and Pepsi have done a better job than most marketers in driving consumers to have a strong preference for brand name products in their category. Only 6% of consumers have a preference for generic products, and only 31% of consumers are indifferent between brand names and generics. Jay Waters is SVP/Chief Strategy Officer at Luckie & Company. You can contact him by email. This entry was posted in Family Panel, Shopper Marketing. Bookmark the permalink.